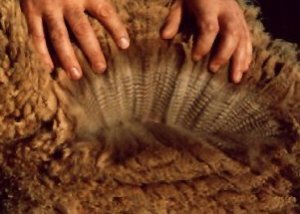 For centuries sheep have been selectively bred to produce white wool, the main stimulus being the development of dyes which allowed a wider range of colours to be produced than the natural black, grey and brown wool of most of the primitive breeds of sheep. This selection for white sheep is likely only to have masked the presence of colour genes in modern white breeds, due to the inhibiting action of the dominant white gene. It is not uncommon for black or coloured lambs to appear in a white flock, but these lambs are usually culled. However, what is not always recognised is the fact that to produce a coloured lamb, both parents must be carrying a gene for colour. Inheritance is mainly controlled by GENES which occur in pairs (one gene being derived from each parent). Each pair occurs at a definite point or LOCUS in the cells of the body. Reproductive cells are formed by the division of other cells, each sperm or egg receiving one of each pair of genes. The genes which may occur at one locus may take two or more forms, each producing a different effect in any characteristic influenced by that pair. Genes are transmitted unchanged from parents to offspring. During reproduction, the gene pairs split into sperms (male) and eggs (female) and recombine at random to form a fertilised egg. Where there are two or more different genes that can occur at a specific locus, these are termed ALLELES. An animal can have two different alleles (heterozygous form) or two the same (homozygous form). 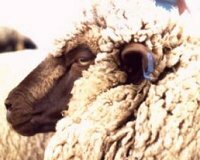 This is the case with the gene pair that determines wool pigmentation in most domesticated sheep breeds. If a sheep has only the WHITE allele present, then the animal produces white wool, and if only the BLACK allele is present then the animal produces black wool. But if BOTH white and black alleles form the gene pair, the animal is white. In the HETEROZYGOUS animal, the gene which exhibits the characteristic it controls by masking the effect of the other in the pair is termed DOMINANT, and the gene whose characteristic is hidden is termed RECESSIVE. With most breeds of sheep, white is dominant and colour is recessive. The mating of two sheep, one possessing the WW combination and the other possessing the ww form must produce offspring with Ww paired genes, since one must be contributed by each parent. This new individual will appear white because the white allele will dominate the black allele. However, white offspring will be carriers (heterozygous) for the black pigmenting factor. Ww Heterozygous white - but a carrier for the desired black gene. The recessive allele 'b' which is responsible for the "moorit" or brown genotype, is to be found in white sheep and coloured sheep. Just as there is no visible difference between the while woolled heterozygous (Ww) and white woolled homozygous (WW) sheep, there is no visible difference between a homozygous black (wwBB) sheep and a black sheep heterozygous for brown (wwBb). 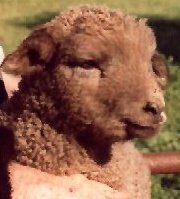 Only sheep HOMOZYGOUS for the recessive allele 'b' are identifiable as being brown. Brown sheep are characterised by a deep red-brown (almost purple) nose, eye socket and lip tissue. This colour contrasts strongly with the definite black pigmentation evident in sheep producing black or grey fleece. This skin colour extends to the tongue and palate but is far less intense, making the difference in colour between brown and black sheep less easily discernible. Facial hair on brown genotypes is also red-brown, as is the hair on the lower legs. Some black lambs are born with tan hair covering on the face and legs, but this is shed as the lamb matures. On brown genotypes, the red-brown hair covering persists and occupies the entire area of pigmented skin, and there is minimal fading with age. Black sheep have black hooves, whereas moorits have hooves of deep brown, but weathering of the outer horn material masks the true colour and is difficult to perceive. Black sheep produce a range of fleece colours from jet black to pale silver. Moorit genotypes produce a similar wide range of fleece colours, from deep chocolate brown to a very pale fawn. At the extremes of each range there can be confusion in identifying moorits. 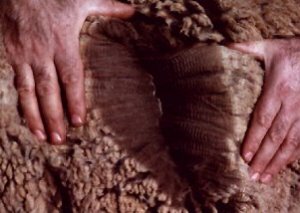 Dark brown fleeces are not uncommon on sheep of the black genotype and on the wool table can be mistaken for moorit fleeces. At the other end of the scale, very pale fleeces from both moorit and black genotypes can be very difficult to distinguish from each other, and from white fleeces. The most reliable means of identifying the moorit genotype is the facial colouring, considered with other characteristics of hoof material, fleece colour, and skin and eye colour.